Up until 1826 there was no bridge across the Merrimack River from as far south as Lowell and north as Manchester. Reacting to this need some of the more prominent men of Hudson and Nashua petitioned the State Legislation for a charter to build a bridge. The wooden bridge shown in this picture was built by the Proprietors of the Taylor Falls Bridge and opened as a bridge in 1827. The characteristics of this bridge are quite interesting. It was 509 feet long with a 16 foot roadway and no sidewalks. The abutments had one tier of faced stone on the outside, filled with loose stone, all laid dry with no cement. 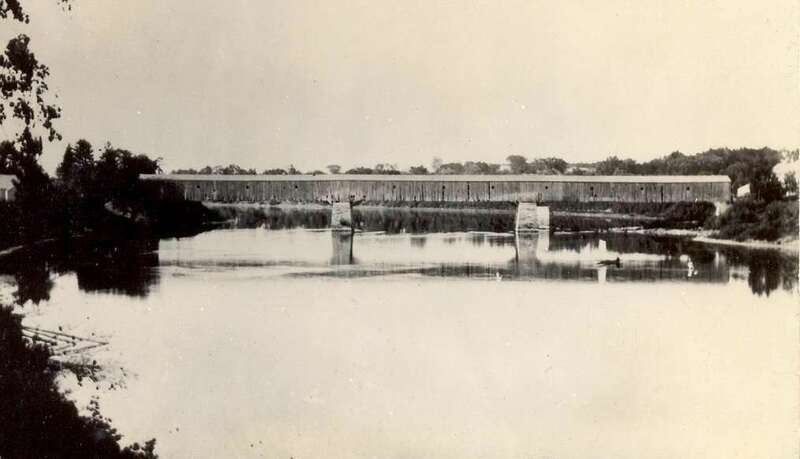 A few years after completion ice jams and water pressed so hard against the abutments that an ice break was erected in 1834 to buffer the bridge from this danger. This ice break remained in use until it was removed during construction of the Veterans Memorial Bridge. It continued as a toll bridge until about 1855 when the county laid out a public highway over the bridge and it became a toll free bridge. At a town meeting in 1881 a committee was chosen to examine the bridge and consider what was best: repair or replace. The committee recommended replacement as soon as practical. After conferring with a similar committee from Nashua the decision was made to replace this wooden bridge. Photo from the Hudson Historical Society collection. By Ruth M Parker in Bridge Area, Bridges on August 14, 2015 . Visited Hudson last wkend and toured the National Historic Register Alvirne (Hills House). Wonderful job the volunteers are doing there. Very well attended Hudson Old Home Days… carnival, races… good family fun. Wish I had known you had several Nat’l Register places before I went. Next time I’ll see the chapel and more. Thanks for your wonderful comments!! I will pass them along to the Society members and the Old Home Day Committee. Trying to find you on facebook. can’t find Hudson historical society FB page. Only found web site. Not sure why you had problems. Within FB search for Hudson Historical Society. Our profile is a pic of the Hills House.